Also, making Game of Thrones references in recruitment promotions may or may not make you total nerds. No judgment here. We’re nerds, too. But coming up with catchy slogans to promote your chapter recruitment only encapsulates one small part of all that goes into sorority recruitment management. Each year when you see freshmen women streaming toward the dorms with boxes and parents in tow, it’s time for your chapter to go to work. Maybe you plan to carry their bags, hold doors and give dad directions. Remember to wear your letters. You can endear yourselves to these new students, who’ll remember you when they seek bids. Either way, you’ve been planning for this long before move-in day. From a potential new sister’s perspective, your chapter shows everyone a good time during rush week. You’re laid back and carefree, and it’s all so much fun. From your perspective, you’ve been pulling your hair out for months placing orders, planning events, and somehow making the numbers fit within the budget. The week of recruitment is just the final stretch for you. Oh, and that “carefree” vibe you’re giving off? It’s a put-on. You’re still very much “on the clock”. You’re still managing like a boss. You’re exhausted, and the semester’s just beginning. Fear not. There are ways your chapter can make recruitment easier and more successful. OmegaFi wants to help you Win Recruitment. Check out these Tips for Managing Sorority Recruitment. Plan recruitment events thoroughly and have a strategy for extending bids before the week of chaos. Give yourself time to correct potential snafus with merchandise orders, iron out budgeting, and get your schedule down pat. That means using at least the previous spring semester to plan. Once your house opens to potential new members, you probably won’t remember your own name, let alone possess a level enough head to hammer out major problems. Finalize recruitment and bid day themes. Have your promotional materials all set to go. Organize and review PNM documents. Get a list of alumnae attending and helping during the weeks activities. Get on same page with your sorority president and other executives. Submit info for the Panhellenic Council. Discuss expectations with sisters such as chapter values, proper conduct and attire. Everything else--finalizing event food orders, decorating, practicing your skit, etc. The more you plan, the more confidently you’ll manage. Don’t worry if you’re nervous going into the week; it’s pretty common to get the jitters about meeting so many new people. It’s thrilling and overwhelming. Expect at least one thing to go wrong, one unexpected surprise, and one thing to go wondrously right. Almost certainly, though, it’ll be more than that on all counts. Be confident in your plan and schedule, but be prepared to tweak and adjust as the week wears on. Rely on your executives and veteran sisters to guide you through rough patches. Don’t think too far ahead. It’ll only freak you out. Take it on a day-by-day basis. When you take a deep breath and slow your thinking, you can get things back on track. When food doesn’t show up on time, a sound system doesn’t work, or a sister says the wrong thing to a potential new member, you’re prepared to handle it. It certainly isn’t fun or flattering when an event goes awry, but it’s up to you not to let one slip-up spiral out of control. Focus your plan on getting to know PNMs. The important thing is asking and answering questions to find out who’s a good match and who isn’t. Even if your informal events don’t go completely as planned, try to make an impact on potential sisters during the formal rounds of recruitment. Represent your letters as best you can. Fun is fun, but in the end you’re choosing who will be your future sisters for the rest of your lives. Give due diligence with the bid process. 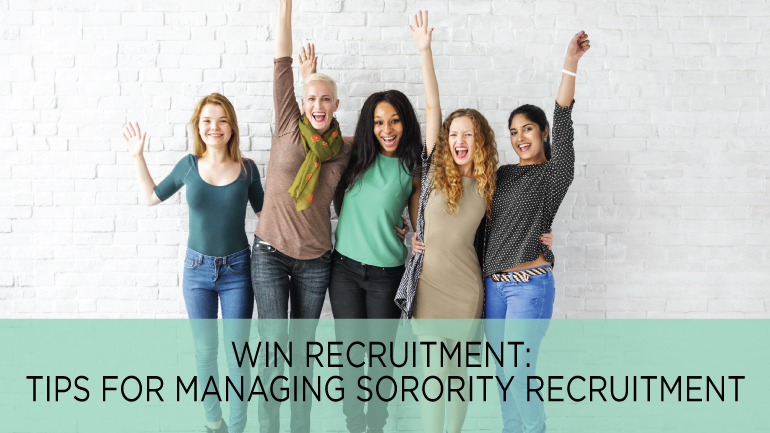 Sorority recruitment software like OmegaRecruit can help streamline the process of voting. Send your recruitment chair for a spa day. She’s going to need it. This process may have felt a lot like Ariana Grande’s “thank u, next.” Some PNMs taught you love. But during most of the week you were just losing your patience and feeling the pain. Yet the journey’s just beginning for both new and seasoned sisters. Even though you’ve recruited quality sisters, that doesn’t mean going through the new sister education process will be a cakewalk. Managing sorority recruitment doesn’t end after bid day. It’s part of a holistic effort to build long-term success in your chapter. That means bringing in quality bids, but also continued efforts to educate sisters and instill sorority values. It means that big sisters must teach little sisters the ropes, and stick by them through thick and thin. The sisters you recruit today will decide the chapter’s future tomorrow. Even though you’ve been wearing your letters a lot longer than the new pledge class, you’re not done learning. Admit and grow from your mistakes. Don’t be so sure of yourself that you can’t learn from the younger sisters. Every sorority pledge class has one thing in common: You were recruited not for your perfection, but for your potential. Sorority recruitment, from start to finish, is no easy task, so plan and schedule thoroughly. Manage the heck out of the events. Build a successful future for new and old members alike, so sisters can truly win at recruitment. What tips would you give for managing a successful sorority recruitment? What pitfalls would you warn other chapters about? Let’s chat about it below in the comments.